The Boston Red Caps played in the first game in the history of the National League, on Saturday, April 22, 1876, defeating the Philadelphia Athletics, 6–5. In the meantime, fans had to be satisfied with the achievements of Hank Aaron. 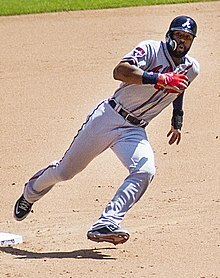 In the relatively hitter-friendly confines and higher-than-average altitude of Atlanta Stadium ("The Launching Pad"), he actually increased his offensive production. Atlanta also produced batting champions in Rico Carty (in 1970) and Ralph Garr (in 1974). 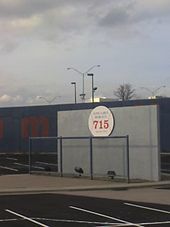 In the shadow of Aaron's historical home run pursuit, was the fact that three Atlanta sluggers hit 40 or more home runs in 1973 – Darrell Evans and Davey Johnson along with Aaron. Media magnate Ted Turner purchased the team in 1976, and played a large role in the team's operation. 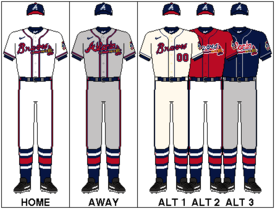 The Braves currently have five different game baseball uniform combinations. ^ . The Cubs are a full season older as they were originally founded as the Chicago White Stockings in 1870. The White Stockings did not field a team in 1871 or 1872, however, due to the Great Chicago Fire. The Braves, therefore, have played more consecutive seasons. ^ "Meet BLOOPER". Braves.com. MLB Advanced Media. Retrieved August 21, 2018. ^ a b "Braves Uniforms". Braves.com. MLB Advanced Media. Retrieved January 19, 2019. ^ a b Bloom, Barry M. (May 16, 2007). "Braves sale is approved". MLB.com. MLB Advanced Media. Retrieved October 1, 2015. ^ "Executive Offices". Braves.com. MLB Advanced Media. Retrieved October 1, 2015. ^ Nightengale, Bob (November 13, 2017). "Atlanta Braves hire Alex Anthopoulos as next general manager". USA Today. Retrieved November 13, 2017. ^ Bowman, Mark (November 11, 2013). "Braves leaving Turner Field for Cobb County". Braves.com. MLB Advanced Media. Retrieved October 1, 2015. ^ Bowman, Mark (January 17, 2017). "Braves eye new Spring Training complex in North Port". MLB.com. MLB Advanced Media. Retrieved August 23, 2017. ^ "Yanks celebrate ninth straight East title". Retrieved July 11, 2008. 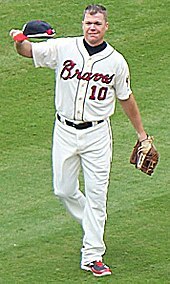 ^ Bowman, Mark (September 13, 2006). "Braves have set lofty benchmark". Braves.com. MLB Advanced Media. Archived from the original on February 19, 2007. Retrieved August 21, 2018. ^ a b "Story of the Braves". Braves.com. MLB Advanced Media. Retrieved February 18, 2019. ^ Thorn, John (May 4, 2015). "Why Is the National Association Not a Major League … and Other Records Issues". OurGame.MLBlogs.com. Major League Baseball Advanced Media. Retrieved November 1, 2015. The National Association, 1871–1875, shall not be considered as a 'major league' due to its erratic schedule and procedures, but it will continue to be recognized as the first professional baseball league. ^ "1914 Boston Braves Schedule by Baseball Almanac". Baseball-almanac.com. Retrieved July 25, 2011. ^ "1914 New York Giants Schedule by Baseball Almanac". Baseball-almanac.com. Retrieved July 25, 2011. ^ a b c d Neyer, Rob (2006). Rob Neyer's Big Book of Baseball Blunders. New York: Fireside. ISBN 978-0-7432-8491-2. ^ a b Olson, Lisa (July 8, 2003). "Crazy scene at Shea takes luster off Mets-Braves rivalry". New York Daily News. ^ Isidore, Chris (December 14, 2005). "Time Warner considers Braves sale". CNNMoney.com. Retrieved April 27, 2011. ^ Burke, Monte (May 5, 2008). "Braves' New World – Forbes Magazine". Forbes. Retrieved July 25, 2011. ^ Bowman, Mark (May 16, 2007). "Braves excited by news of team sale". Braves.com. MLB Advanced Media. Archived from the original on July 13, 2015. Retrieved February 18, 2019. ^ Bodley, Hal (October 12, 2007). "GM Schuerholz was Braves' guiding force". USA Today. Retrieved April 25, 2010. ^ Bowman. Mark. "Atlanta adds Vazquez to new-look staff, Braves complete deal for durable veteran starter, reliever Logan". mlb.com, December 4, 2008. 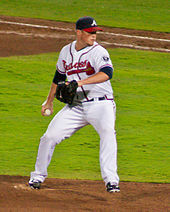 ^ "Tigers acquire Josh Anderson from Atlanta Braves" MLB.com, March 30, 2009. ^ "Braves act quickly, name Gonzalez skipper". Atlanta.braves.mlb.com. October 13, 2010. Archived from the original on June 16, 2011. Retrieved July 25, 2011. ^ "ESPN – Elias Says: Sports Statistics – Stats from the Elias Sports Bureau – ESPN". ESPN. Retrieved July 25, 2011. ^ "MLB Game Recap – Nationals v Braves | ajc.com". Ajc.stats.com. Retrieved July 25, 2011. ^ "Florida vs. Atlanta Recap: Marlins beat Atlanta 3–1, Braves' 10,000th loss". Sports Illustrated. July 31, 2011. Retrieved August 13, 2012. ^ Atlanta team statistics for 2010, 2011. baseball-reference.com. Accessed May 20, 2011. ^ "Braves collapsed before playoffs". ESPN. September 29, 2011. ^ "Anatomy of a Collapse (Or Three)". MLB Blog Buzz. September 29, 2011. Archived from the original on October 16, 2011. ^ a b c d O'Brien, David (October 1, 2011). "Chronology of Braves' collapse". The Atlanta Journal-Constitution. Archived from the original on October 3, 2011. Retrieved April 19, 2018. ^ "Lowe dealt to Tribe for Minor League reliever". atlantabraves.com. October 31, 2011. ^ "Braves complete colossal collapse, lose to Phils". CBS Sports. September 29, 2011. ^ "Parrish let go as Braves hitting coach". atlantabraves.com. September 30, 2011. ^ "B.J. Upton introduced in Atlanta after signing deal". ^ "Justin Upton introduced, takes his place with Braves". ^ "Atlanta Braves beat Miami Marlins for 14th straight win". USA Today. ^ "Braves retire Chipper's No. 10 before game". ^ "Braves overcome injuries to capture National League East title". ^ "The Braves are leaving Turner Field after the 2016 season". NBCSports.com. November 11, 2013. Retrieved November 11, 2013. ^ "Braves plan to build new stadium in Cobb". ^ Brown, Maury (November 11, 2013). "Atlanta Braves Plan On Moving Into New $672 Million Ballpark In Cobb Co. – Forbes". Forbes. ^ "Stunning news: Atlanta Braves moving to Cobb". ^ "Braves trade Gattis to Astros for 3 prospects". ^ "Padres acquire Kimbrel, M. Upton from Braves". ^ "Braves' Hector Olivera arrested for assault". ^ Waldstein, David (November 10, 2016). "R. A. Dickey Isn't Done; Signs One-Year Deal With Atlanta Braves". The New York Times. ISSN 0362-4331. Retrieved November 18, 2016. ^ "BASEBALL: Atlanta Braves officially sign pitcher Bartolo Colon". savannahnow.com. Retrieved November 18, 2016. ^ Studenmund, Woody (May 3, 2017). 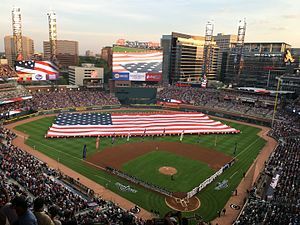 "Atlanta's SunTrust Park: The First of a New Generation?". Hardball Times. Retrieved November 18, 2017. ^ a b Cooper, J.J. (May 2, 2017). "Braves' New Ballpark Has All Modern Touches, But It's What Surrounds SunTrust Park That Makes It Stand Out". Baseball America. Retrieved November 18, 2017. ^ "Braves GM John Coppolella Resigns Amid MLB Investigation Over International Signings". Sports Illustrated. October 2, 2017. Retrieved November 13, 2017. ^ a b c d "Braves hire former Dodgers, Blue Jays exec Alex Anthopoulos as GM". ESPN. November 13, 2017. Retrieved November 13, 2017. 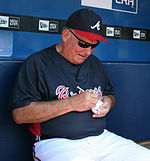 ^ a b "John Hart steps down as senior advisor for Braves". ESPN. November 17, 2017. Retrieved November 18, 2017. ^ a b c d "Ex-Braves GM John Coppolella permanently banned; team loses prospects". ESPN. November 21, 2017. Retrieved November 21, 2017. ^ Schultz, Jeff. "If Braves send message to Phillies, it will be done nicely". The Atlanta Journal Constitution. Archived from the original on April 11, 2011. Retrieved May 26, 2011. ^ "Atlanta Braves unveil a new alternate home uniform". MLB Advanced Media. February 6, 2012. Retrieved April 19, 2018. ^ "Boston Braves Logos". SportsLogos.net. Retrieved June 19, 2018. ^ "Milwaukee Braves Logos". SportsLogos.net. Retrieved June 19, 2018. ^ a b c d e "Atlanta Braves Logos". SportsLogos.net. Retrieved June 19, 2018. ^ Araton, Harvey (April 14, 2010). "Yankees' Mariano Rivera Is the Last No. 42". The New York Times. Retrieved July 30, 2012. ^ Pahigian, Josh; Kevin O'Connell (2004). The Ultimate Baseball Road-trip: A Fan's Guide to Major League Stadiums. Globe Pequot. ISBN 1-59228-159-1. ^ a b "Atlanta Braves Attendance". baseball-reference.com. Retrieved July 24, 2012. ^ Tucker, Tim (March 1, 2013). "Braves' TV deal changes; games move off Peachtree TV". The Atlanta Journal-Constitution. Retrieved April 19, 2018. ^ Press Release- "Atlanta Braves and Clear Channel Announce Move to Project 9–6–1 for 2009 Games." March 2, 2009. Retrieved July 8, 2010. ^ "Affiliate Radio Stations | braves.com: Schedule". Atlanta.braves.mlb.com. Archived from the original on July 14, 2011. Retrieved July 25, 2011. ^ Rogers, Carroll (January 27, 2009). "Sutton rejoins Braves' broadcast team". Ajc.com. Archived from the original on June 29, 2011. Retrieved July 25, 2011. ^ "Sportingnews.com". Sportingnews.com. Archived from the original on August 9, 2008. Retrieved July 25, 2011.